Music at St Augustine’s is overseen by the Director of Music, Nathan Bird. 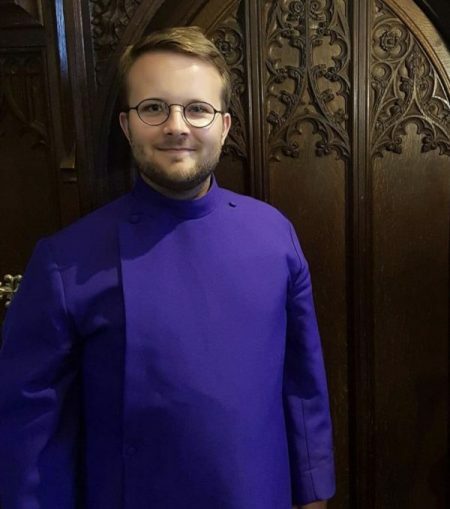 Nathan took up the post of Director of Music at St Augustine’s in May 2015, where he plans the music, plays the organ for the weekly services, and rehearses the choristers and adults of the choir. Since arriving at St Augustine’s, he has increased the number of singers in the choir and set up a successful choristership scheme. He has greatly increased the variety and quality of the repertoire that the choir sings. Nathan combines this role with his freelance career as an organist, accompanist and private music tutor, teaching organ, piano, singing and music theory. Nathan previously held the post of organist at Christ Church, Pant (Merthyr Tydfil) from August 2012. Nathan completed a Postgraduate Certificate of Education at Cardiff Metropolitan University in July 2016, specialising in teaching Music (Secondary). Nathan completed his undergraduate degree at Cardiff University, studying the organ with Robert Court, and graduated with a degree in music in July 2014. Whilst at Cardiff University, he took an active part in practical music. He played organ and percussion in the Cardiff University Symphony Orchestra and sang bass in the Cardiff University Symphony Chorus. He was also the accompanist for the Aberdare Hall Choir. He also accompanied singers and instrumentalists on the piano and harpsichord. Error: Error validating access token: Session has expired on Saturday, 06-Oct-18 08:26:18 PDT. The current time is Sunday, 21-Apr-19 11:49:28 PDT.